If you're going no further than the sofa, here are some tips on what's worth watching on the box between Friday and Sunday. . .
You could easily miss this period drama as it's going out on Virgin Media's third channel, yet it's likely to be regarded as one of the TV shows of 2018 when it comes the time to look back on the year's best offerings. 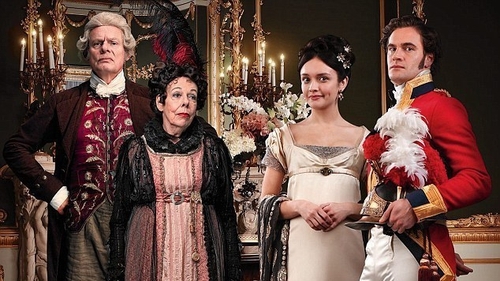 It's a pretty modern take on the Thackeray classic, and the cast - including Michael Palin as the author/narrator - is great, particularly Olivia Cooke. She plays lowly teaching assistant Becky, who issues headmistress Miss Pinkerton (Suranne Jones) with an ultimatum: pay her properly to teach at her Academy for Young Ladies or find her a station elsewhere. Miss Pinkerton calls her bluff, and Becky is forced to pack away her meagre possessions. Kindly stockbroker's daughter Amelia Sedley (Claudia Jessie) takes pity on the poor orphan and offers to take her home for the week . . . This Strictly special sees more than 30 past contestants reminiscing and sharing insider stories, rituals and secrets from the 15 seasons of the show so far. The participants will take a look at some of their most memorable routines, their highs and lows, and many funny moments audiences will remember fondly. Some celebrities were on the dancefloor over a decade ago and yet still they remember the experience in intricate detail. Those involved include the likes of Jeremy Vine, Deborah Meaden, Ruth Langsford, Molly King, Daisy Lowe, Russell Grant, Nancy Dell’Olio, Judy Murray and Robbie Savage. If you missed this when it started on RTÉ 2 a few weeks ago, don't let it go a second time. Written by Fleabag star Phoebe Waller-Bridge, it's a cracking cat-and-mouse drama. Based on the novellas by Luke Jennings, Killing Eve centres on two women: Eve (Grey's Anatomy star Sandra Oh), a bored MI5 security officer dreaming of being a spy, and Villanelle (a superb Jodie Comer, who was last seen in Doctor Foster), a mercurial killer who clings to the luxuries her violent job affords her. In this opening episode, a Russian politician is murdered. Eve Polastri is tasked with protecting the only witness but soon finds herself on a collision course with a violent and extraordinary assassin. This iconic dud clip show was originally presented by Denis Norden from 1977 until 2006 before Griff Rhys Jones took over from 2008 until 2016. Now David Walliams - or, a tiny animated version of him - gives it a go. Expect screw-ups from the start, and plenty of them. Fun alert! Based on Deborah Harkness’s bestselling novel of the same name, brilliant historian and closet witch Diana Bishop (Teresa Palmer) calls up a magical manuscript from Oxford University’s Bodleian Library. She's been denying her witch heritage for years, but her discovery throws her back into the world of magic and into the path of Matthew Clairmont (Matthew Goode), a vampire searching for the book. But as news of the book’s appearance spreads, Diana finds herself in grave danger as the fragile peace that exists between witches, vampires and daemons begins to crumble. Some of the greatest drummers on the planet discuss their passion for music and the artists who inspire them. On a practical level, the drummers play and demonstrate how iconic beats and solos are created and how they make a unique contribution to the creation of legendary tracks. These performances are intercut with archive footage of classic concerts showcasing the fine art of drumming. The original reality show is back for yet another run - its last on Channel 5 - as Emma Willis introduces the new crew of previously unknown people who will be competing to be the 18th winner in the show's history. Mary Beard hosts the live, topical cultural debate programme, where tonight she and her guest panellists discuss the representation of older people in culture, and features a rare television interview with writer, poet and cultural commentator Clive James. The first season of the post-apocalyptic US horror drama and companion series to The Walking Dead concludes. As the civil unrest grows and the dead take over, Travis and Madison attempt to devise ways to protect their nearest and dearest. Frank Skinner hosts as Bill Bailey, Una Stubbs and Alice Levine compete to have their pet hates and peeves consigned to Room 101. Topics include taramasalata, people who talk too loudly and drama cliches. One of the best shows of the last decade returns. Season four applied gentle brakes to the downward spiral of Will Arnett’s protagonist, with the introduction of the young Hollyhock providing some much-needed stability in his life. Will Arnett will undoubtedly be back as the titular anti-hero, alongside Alison Brie (GLOW, Mad Men), who plays his one-time love interest and ghostwriter Diane, and Breaking Bad’s Aaron Paul as his asexual best friend and frequent houseguest Todd. This week, the hugely popular Pat Shortt searches out his family tree and traces back five generations in rural Offaly. What appears to be a life of poverty and evictions turns around in the 1850s with the arrival of the railroad. Music, ambition and invention brings Pat to London to follow the footsteps of his grandfather into World War II where he discovers the secret work carried out by his mysterious granduncle Brendan during the Blitz. Over on his maternal side, Pat unearths the story of a murder mystery that gripped Ireland. Here's a glorious way to turn Saturday night into Sunday morning – in the company of Robert De Niro and Harvey Keitel in this 1973 classic that effectively launched both them and director Martin Scorsese. Keitel plays Charlie, a compromised catholic - is there any other kind? - who works for his loan shark uncle, and feels responsible for his self-destructive friend Johnny Boy, played by De Niro. If you haven't seen it before, it's one of the greatest films ever made and essential viewing for anyone with even a passing interest in cinema. A star-studded cast that includes Kenneth Branagh, Penélope Cruz, Willem Dafoe, Judi Dench, Johnny Depp, Michelle Pfeiffer and Daisy Ridley feature in this Branagh-directed version of Agatha Christie’s classic murder mystery. Branagh plays the impressively-moustached (shades of Jerry Fish) Belgian sleuth Hercule Poirot, aboard a train bound for Calais that becomes a murder scene. But who amongst the passengers is the killer? One of the most popular medical dramas in television history - and it's also the show that launched creator Shonda Rhimes, who is now a TV colossus. Set in a fictional Seattle hospital, the series follows a skilled medical team, including Meredith (Ellen Pompeo), Cristina (Sandra Oh) and Derek (Patrick Dempsey), as they attempt to balance their hectic personal lives with their equally demanding medical careers.